This is the swatch I've been looking forward to posting! I basically fell in love at first sight with this polish. 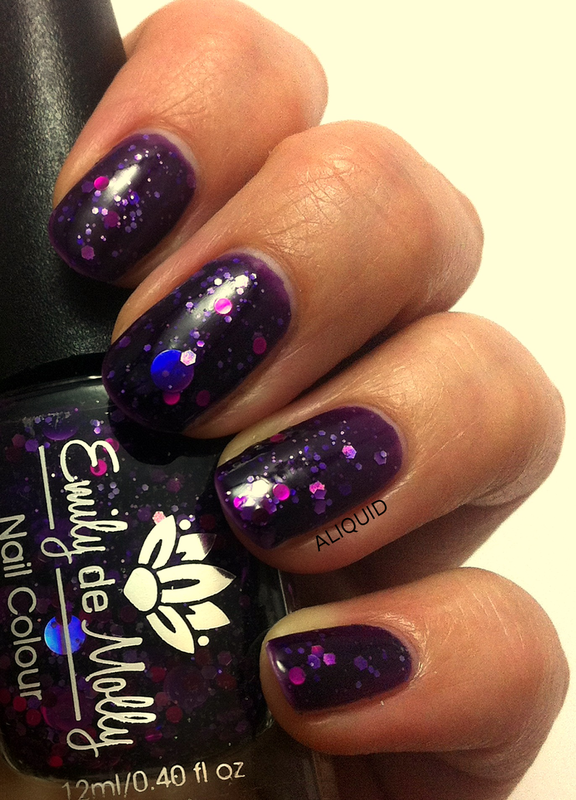 Emily de Molly Cosmic Forces is a plum-colored jelly with a variety of pink and holo glitter, both hexes and circles. My nails look like gems with this polish! Emily de Molly Cosmic Forces. Two coats with Out the Door and Gelous topcoats. I also love this hidden-glitter type of polish because sometimes the glitters seem to vanish, but then you move your hand a little and they flash at you! The formula of Cosmic Forces was pretty good, other than the density of the glitter. With some of the bigger glitter pieces you might have to work to place them where you want them. I knew the polish would end up a bit bumpy, so I took the opportunity to use Gelous as a topcoat for the first time. If you're not familiar with it, Gelous is a base/topcoat that's really thick. "Luxurious" might be the best way to describe it. With one coat my nails are still slightly rough in places, but much smoother than before. And it dried faster than I expected for such a thick polish. I bought Gelous at Sally Beauty ($5.99 for 15 ml, $5.39 with a Beauty Club membership).